A few months ago, I posted here a tutorial on downloading or saving Flash/YouTube Videos on Linux the easy way. If the previous instruction is really difficult for you to grasp, then you should read this latest entry very carefully :-) Because now I'm going to show you how in the simplest way possible you can download a YouTube video plus convert it at the same time. --So easy that the only requirement is a web browser (no need for add-ons) and probably .01% of your brain. Step 1: Visit YouTube and select a video to watch. 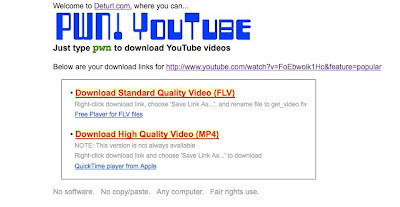 Step 3: You will then be redirected to deturl.com where you will be presented with two download links. One is an FLV file and the other one is an MP4 file for the happy iPod/iPhone owners. Step 4: Click on the link of your choice and save the file.